Friend and represented artist. . . a fashionable man about town has passed. He will be missed and remembered much. Friend, represented designer and award-winning Canadian Fashion designer Pat McDonagh, whose legendary fashion career spanned more than half a century, has died in Toronto. She was 80. Friend, Associate, Mother, Artist and more. .. It is very sad and unfortunate to have lost my good friend, trusted associate and artist Susan Gardos. She was a caring and considerate individual. Her illustrative work encompassed a broad range of images and ideas that were appealing to both young and old alike. Backed by decades of professional experience as a commercial artist, herd work has been published for book covers, advertising and packaging. Landmark Design welcomes it's new association with Hydes Distribution and Zippo Canada. Gary Hyde and his organization have over 30 years experience in the areas of product sales and distribution, and product licensing. Together we are developing new products and licensing arrangements for special retail markets, begiining with an exclusive arrangement for ZIPPO Limited Edition collectible lighters and much more. As the affairs of LKT Creative Licensing move to a close, Landmark Design welcomes a new relationship with Creatif Licencing of New York. Creatif is a full service licensing agency that provides clients with the professional management necessary to develop a merchandise licensing program. Our prominent reputation in the industry stems from more than 33 years of successfully implementing market strategies and licensing for domestic and international industries. Press release - 04/12/2007 re: Dubi Arie & "The Mission"
Landmark Design is pleased to announce it's direct representation and involvement with one of Dubi Aries most ambitious acomplishments to date. Unique in scope and unrivalled in proportion, “The Mission”, commemorating 4000 years of Jewish history, speaks to the struggle of people of all ages, and religious persuasions and was created to remind us all, to end the aggression that leads to war and destruction between nations and stop the hate that divides the peoples of the world. It is Dubi Arie’s ardent hope that “The Mission” will impart deep feelings of unity to the Jewish people, and establish bridges of understanding between Jews and all of mankind. Through new exhibitions, corporate sponsorship and public support, we are hopeful that this work’s enormous artistic and educational value can be shared globally, and that a permanent home for this historically relevant work of art can be found in time for Israel’s sixtieth year of independence celebration in 2008. Louise Kates Ternay, President and founder of LKT Creative/Licensing, Inc., died peacefully at her home in Bala Cynwyd, PA., on 6 December 2007. At age 63, she had lost her 2 year battle with colon cancer. Louise was born in Philadelphia, PA., on 10 July 1944, to her parents, Bernard and Doris Kates. Louise graduated from Hatboro-Horsham High School (PA.) in 1962. Active throughout her life in the arts, Louise began her career representing artists in 1975, first as an agent for her Illustrator husband, Bill, then expanding her portfolio to include graphic designers, photographers, and other illustrators. In 1986 she was asked to be VP of Artist's relations at the Franklin Mint. For the next 8 years Louise traveled the US and Europe seeking and negotiating with artists for Mint projects. Louise left the Mint in 1994 to create her company, LKT Creative/Licensing, Inc. Taking advantage of her many contacts at the Mint, Louise had access to over 700 artists around the world. She presented their art annually at her booth at the International Art Licensing Show, in New York's Javits Center. She was a member of the Art Advisory Board of LIMA, participating as a panelist in a variety of conference programs to educate artists about the business of Art Licensing. She was also a member of the Philadelphia Art Directors Club, and the Society of Illustrators, in NY.A talented artist in her own right; Louise was a ceramist, paper-maker, weaver, and print-maker. She was bright, aggressive, and respected by the many artists and business colleagues with whom she interacted. In addition to her husband Bill, Louise is survived by three sisters, her sons Will, Pierce, and Mason, and her granddaughter, Diver Ida Jane Ternay. A private funeral was held at West Laurel Hill Cemetery, in Bala Cynwyd, PA., on 12 Dec. 2007. Our sincere regards go out to her family, friends and associates. Friends, associates and the arts community are saddened by the loss of one of the most prominent and successful artists in North America today. Hungarian born, Ernie Cselko brought over four decades of passion and creative expression to his work. A fine art painter, commercial illustrator and designer, a private tutor, awarded Gold Medal in Advertising three times, voted in the Best 100 Canadian Posters of the Century, listed in the Canadian Who&rsquos Who and a favorite of the Bradford Exchange. His original art and fine art prints hang in some of the most prestigious and valued private and corporate collections on the continent. His presence, abundant talent and creative ability will be greatly missed by all. Contact us directly for information and art inquiries. A scholarship fund has been set-up in honour of Ernie Cselko through the Ontario College of Art and Design [ OCAD ] Contributions can be made through the information below. As one of the most dynamic artists in North America, Hungarian born Ernie Cselko brought us decades of passion creative expression through his work. He was one of Canada’s leading illustrators, a fine art painter, a private tutor, listed in the Canadian Who’s Who and a favourite of the Bradford Exchange. His unmistakable line style is reminiscent of both Rockwell and Leyendecker, and his powerful painting of shadow, shine and reflection was centered around his unique, condensed formula of the old masters “chiaroscuro” technique. He is most revered for his historically accurate and highly realistic images of Buckskinners and Native Americans. Cselko’s longstanding and deep connection to the Kawartha’s region and it’s history makes the inclusion of “Return of the Eagle” in the Buckhorn Fine Art Festival’s 35th anniversary exhibition an especially fitting choice; and a noble tribute to this artist and his work. 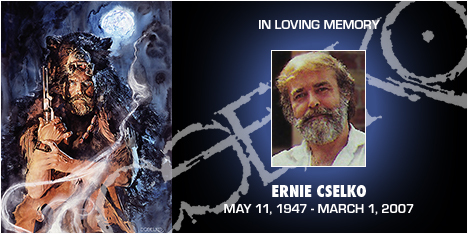 Sadly, Ernie Cselko passed away in 2007. We invite you to experience this rare opportunity to view and purchase one of the few remaining original paintings by this accomplished Canadian artist. SHOPGIRLS GALLERY & BOUTIQUE - FREDERICK WATSON - "WOMEN"